Cracks are the root of all problems for pavement. Once a crack forms, water is able to seep through and erode the base causing deterioration. 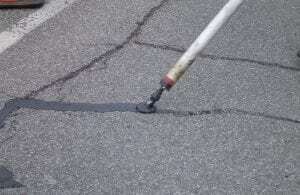 For that reason, crack sealing is recommended as the most cost-effective, preventative pavement maintenance procedure. Transverse cracks run from the side of the pavement toward the middle or all the way across. 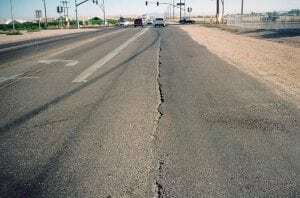 Longitudinal cracks run the length of the pavement, next to the centerline or near the middle of a drive lane. Reflective cracking happens when a pavement has been resurfaced and existing cracks weren’t treated beforehand; now those cracks reflect up through the new pavement and re-form. Alligator cracking develops when crack sealing wasn’t performed earlier in the pavement’s life. Once the pavement gets to this point, crack sealing will not be effective. The proper long-term repair is to remove and replace the affected area. The recommended time to perform crack sealing is in the spring or fall. Pavement expands and contracts with temperature fluctuations and, in spring or fall, the pavement is midway b/w its minimum and maximum movement. Treating cracks at this time of year enables the sealant to fill and seal cracks more effectively. Routing or saw cutting preparation involves creating a reservoir so the sealant has room to adhere to the side walls of the crack. This procedure can add up to 40% to the life of the seal job. Crack preparation can also be done using compressed air. A blower or compressor will blow out any dirt and debris prior to sealant application. Crack sealant can be applied with an oil jacketed machine using a hose and a wand which can be heated or non-heated. A direct-fire unit is another option. This equipment has a pour pot or bander; material is poured into the pot and then applied. Do not over-apply crack sealant, which can be a common mistake during an over-band process. To avoid this, use a sealant disc on the equipment or have a worker follow up with a squeegee to make sure sealant lays tight against the surface. This is very important prior to resurfacing, for example, because hot mix will re-melt excess sealant material. When a roller comes along and hits that spot, the machinery will slip due to the melted sealant beneath it and create a bump on the pavement. 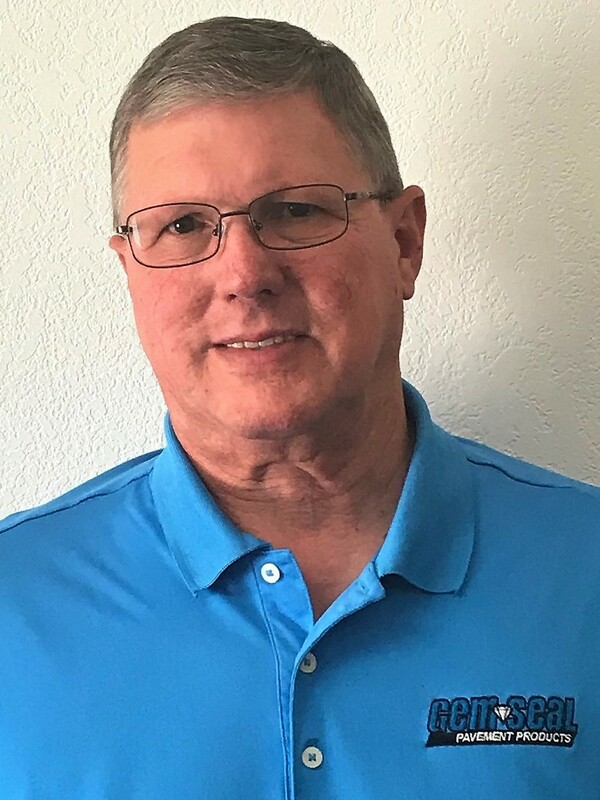 For more information on GemSeal’s crack sealant products or equipment, please visit any of our conveniently located One Stop Shops or contact us. You may also view our latest video on crack sealing.